Integrated Population Monitoring Reporter (IPMR) has been written by Mark Cubitt on behalf of BTO for ringers and nest recorders. The latest version is 2.6.6 (updated December 2017, containing new ring series for 2018-19), which runs on all versions of MS Windows. See below to download the software and accompanying user manuals. Also on this page is extra guidance on submitting data and using IPMR on WIndows 10. Further help on submitting NRS data. shows how to check NRS data and create and send a NRS submission file. Help us check we have your data. When you send a submission file to one of the above addresses, you will receive an auto-reply acknowledging receipt. Later, you will receive a further acknowledgement confirming your records have been processed. Please look out for these acknowledgements to ensure that we've received your data. When you upgrade to Windows 10, you may see an error message when you next try to start IPMR. 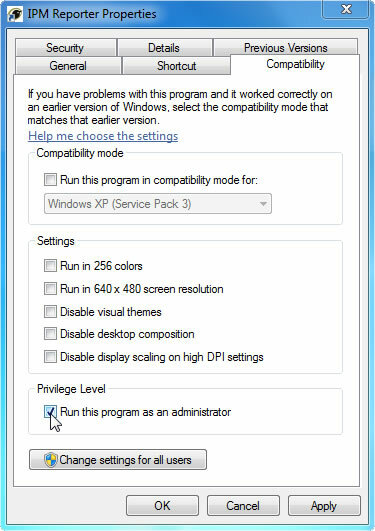 If this happens, right-click on the IPMR Reporter shortcut icon, select the ‘Properties’ menu item, select the ‘Compatibility’ tab when the pop-up window appears, and check the box ‘Run this program as administrator’. Then click ‘Apply’ and ‘Ok’. The latest version of IPMR is 2.6.6 (updated December 2017, containing new ring series for 2018-19). This will run on all 32-bit or 64-bit versions of MS Windows, including XP, Vista, 7, 8 & 10. To install IPMR for the first time or to upgrade to the latest version, download the installer program and the installation instructions via the links below. Once you have installed or upgraded IPMR, double-check you are on version 2.6.6 (updated December 2017) by running the software, opening the 'Help' menu and selecting 'About IPMR'. IPMR has a built it help guide, which can be accessed from the main 'Help' menu. There are also two manual available below, on using IPMR for ringing and nest recording respectively. See the 2019 price list - for updating ring prices in IPMR.